Region of Egypt which the Israelites inhabited during their sojourn in that country. It is described as situated on the eastern frontier of Lower Egypt (Gen. xlvi. 28, 29; Ex. xiii. 17; I Chron. vii. 21), forming an outpost of it (Gen. xlvi. 34); apparently not at all (or scantily) inhabited by Egyptians (ib. ), but, in the estimation of shepherds, evidently "the best of the land" (ib. xlvii. 6,11), since Pharaoh's cattle grazed there (6). According to verse 11 "the land of Rameses" (P?) is synonymous with "the land of Goshen." "Goshen" alone (without the addition "land of") is used only in xlvi. 28, 29. In these two verses it may designate a city, as the LXX. understands it, which here renders "Goshen" by "Heroonpolis," adding in verse 28 to "unto Goshen" the words "into the land of Ramesses"; in xlv. 10 the LXX. transliterates "Gesem of Arabia." This name "Arabia" means, in Egyptian usage, either, generally, all land east of the Nile or, as a special district, the "nome Arabia," the 20th of Lower Egypt. Heroonpolis or Heropolis (according to the excavations of Naville, modern Tell al-Mas-Khuṭa) was, however, the capital of the 8th or Heroopolitan nome, east of the Arabian. Nevertheless, the name "Arabia" seems to be used by the LXX. in the special sense, for in the reign of Ptolemy II. the Greek administration seems to have treated the neighboring 8th and 20th nomes as one district (comp. the "Revenue Laws of Ptolemy Philadelphus," ed. Grenfell, 1896, p. l.). Later, the two districts seem to have been separated again (comp., e.g., Ptolemy, "Geographia," iv. 5, 53). The name "Goshen" (Egyptian, "Ḳsm," sometimes abbreviated into "Ḳs"), occurring first in a papyrus of dynasty 12 (Griffith, "Kahun Papyri," 2, 14), designated, however, the 8th or so-called "Arabian" nome, i.e., the land west of the Bubastide nome, between the Pelusiac branch of the Nile and the canal now branching off at Belbeis. It touched the entrance to the desert valley, now called Wadi al-Ṭumilat, where a fortification, erected in dynasty 12, protected the easiest entrance to Egypt. It is likely that the capital P(er)-sopd(u) (Pisaptu of the Assyrians), situated near modern Safṭ al-Ḥannah, had as profane name the same name as the region, because the classical writers speak of a city Phacus(s)a on that spot (Ptolemy, l.c. ; less distinct are Stephen of Byzantium, the "Tabula Peutingerina," Geographus Ravennatu, and Strabo, who may have confounded with Goshen a city with a similar name, modern Faḳus, northeast of Bubastus). If so, the Biblical pronunciation of the name is authenticated as against the "Ges(s)em" of the LXX. and the dependent versions. The synonymous designation, "land of Rameses," has not yet been found on the monuments, but seems to refer to the region bordering eastward on the land of Goshen, the 8th or Hero(on)politan nome, which is known to have been colonized by the famous pharaoh Rameses II. The LXX. certainly errs in identifying Heroonpolis with Goshen, but is otherwise correct in seeking the Israelitish settlements in that region (which contained the towns of Pithom and Succoth Ex. i, 11, xii. 37, etc. ), the narrow valley Wadi al-Ṭumilat of modern time, between the Crocodile Lake and the old land of Goshen. This part of the country answers perfectly to the description of Goshen in the Bible. It was reached only irregularly by the yearly inundation of the Nile, and therefore was less suited for agriculture. It is necessary only to assume that with the Semites or in popular Egyptian usage the name of "Ḳosem" (Goshen) was extended beyond the limits of the old country and its frontier fortifications. Unfortunately, little is known of the whole region before Rameses II. It might also be assumed that the Israelites settled, in Joseph's time, in the old land of Goshen, and spread in the subsequent period overthe newly colonized district; but this agrees less with the Biblical data. 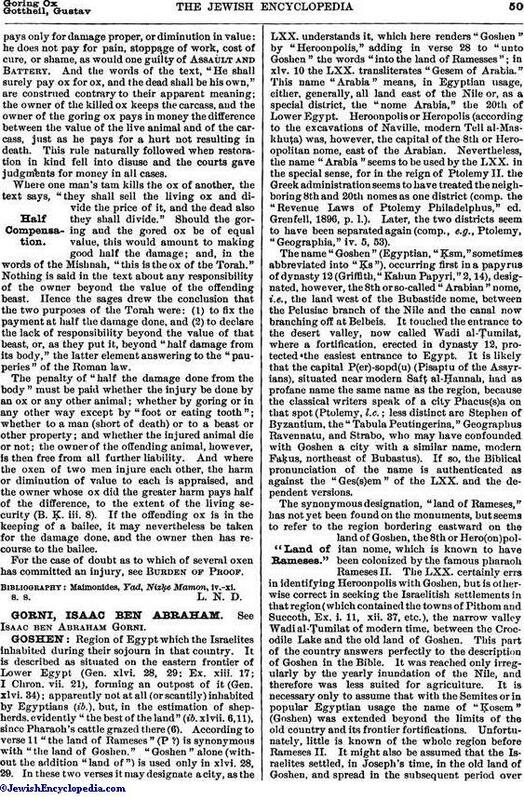 No Egyptian etymology for the name "Goshen" (Ḳosem) has been found, which seems to be of Semitic origin; this would indicate Semitic settlers already c. 2000 or earlier. In Judith i. 9 ("the land of Gesem [R. V. "Goshen"] until thou comest above Tanis and Memphis") the name seems to be used without precise knowledge as to the location of the place. comp. also his Pithom (1st Memoir). 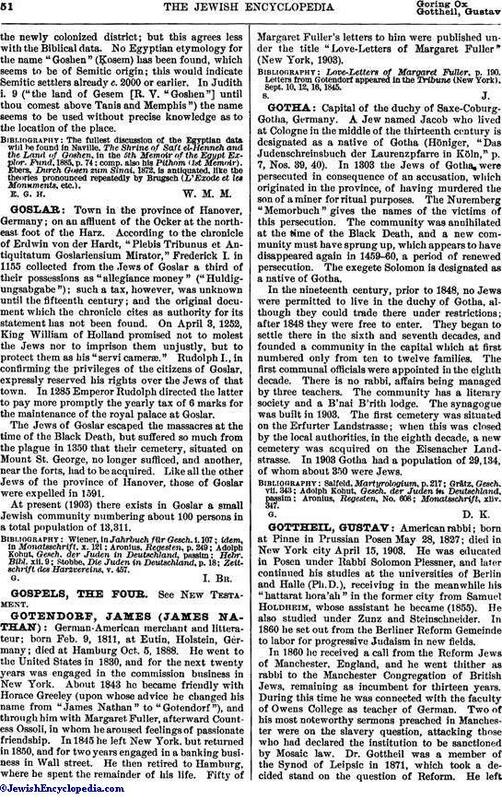 Ebers, Durch Gosen zum Sinai, 1872. is antiquated, like the theories pronounced repeatedly by Brugsch (L'Exode et les Monuments, etc. ).